Bryan Dougles Moles, 43, was arrested Wednesday at the Trump International Hotel after police received a tip he was driving from Pennsylvania to Washington with a car full of “ammunition, survival supplies, batteries and multiple cellphones” and was hoping to “get close to President Trump,” according to the affidavit in support of his arrest. According to the tipster, Moles left a voicemail telling a friend that he was going to the White House to meet with Trump and describing himself as a “refugee intent on bringing down big pharmacy and big-business medicine,” according to the affidavit. Moles will stay in a nearby hotel on Thursday night before going to his scheduled appearance in federal court Friday afternoon. As a condition of his release, Moles must stay away from the White House and the Trump International Hotel, where he stayed the night of his arrest, District of Columbia Superior Court Judge Joseph Beshouri said at Thursday’s hearing. “I didn’t think I’d arrive at this point. But I am here now and I don’t think the law allows anything else,” Beshouri said of his decision to release Moles. According to the affidavit in support of his arrest, a valet at the Trump International told police that Moles had a rifle and a handgun in his black 2017 BMW. Police who searched the car found an AR-15-style rifle and a semi-automatic pistol, as well as high-capacity magazines and ammunition. 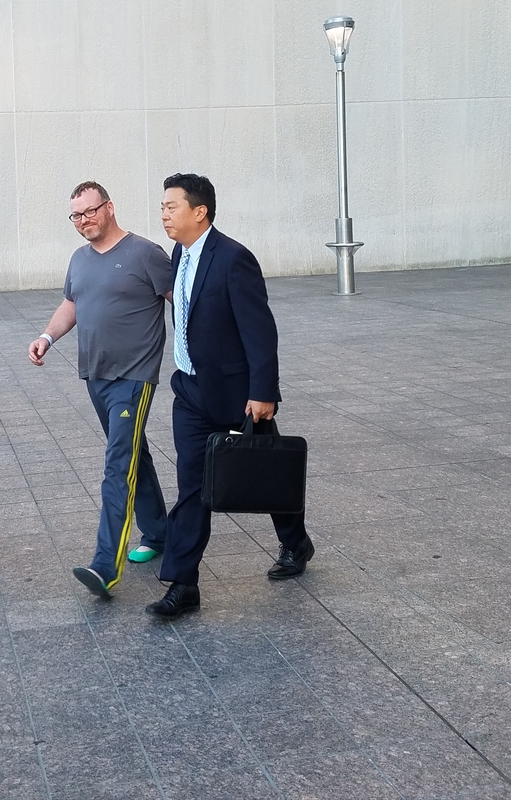 Moles told police and agents of the Secret Service who knocked on his hotel room door that he had brought the guns to Washington so a friend could customize them for his son, according to the affidavit. Moles, a 14-year Navy veteran, told police he suffered from post-traumatic stress disorder which he self-treated with marijuana. He also told officers that he had a stock of more than 20 guns at his Pennsylvania home and had experience making pipe bombs, according to the affidavit. As a condition of his release the government will keep Moles’ weapons, and Beshouri gave him strict instructions not to try to get them – either by himself or with the help of anyone else. The affidavit also makes several references to Oklahoma City bomber Timothy McVeigh, with Moles describing his car in a voicemail to a friend as looking like something McVeigh would drive on a camping trip and telling his police that he left $4.19 cents in his checking account because the number “was significant to him.” As the affidavit notes, the Oklahoma City bombing took place on April 19, 1995. Moles appeared in court wearing a grey short-sleeved shirt, with his graying hair cut short and sporting a light beard. As he waited for the judge to finish considering the case heard immediately before him, Moles leaned against the bench in the basement courtroom of the DC Superior Court. He spoke little at the hearing, beyond telling Beshouri he had not contacted his family recently. “I haven’t talked to anybody in two days, sir,” Moles said just before the hearing concluded. Moles faces a federal charge of unlawful possession of a firearm, as well as a District of Columbia charge of unlawful transportation of a firearm.